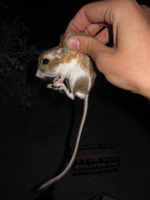 The goal of this project will be to determine the current range and status of the state- and federally-endangered Giant Kangaroo Rat (GKR). Due to the ongoing drought, and concerns over long-term permanent changes in climate within GKR habitat, there is a critical need to understand population dynamics within all GKR colonies across their range. As the five-year review in 2010, the status of GKR in many parts of its range was unknown and the most recent surveys of the satellite colonies occurred in the late 1980s. Acquiring baseline data throughout the range of GKR is necessary for long-term management and recovery of the species as well as assessing the potential impacts of development projects.